There are many different types of occupations both within and outside of health care services that may put workers at risk for exposure to blood related pathogens. Bloodborne kits are designed to allow maximum protection for first responders and workers in the area to avoid serious risks involved in being exposed to blood and other body fluids. Bloodborne kits should be available in any work environment where the risk of exposure to any type of blood, body fluid or contamination is present. 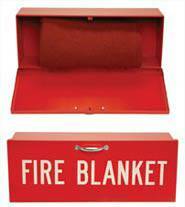 They are also not the same as first aid kits and should be kept separately packaged but with first aid and emergency equipment and supplies. In 1991 OSHA, the Occupational Safety and Health Administration, set out standards and guidelines to minimize the risk for any workers from bloodborne contaminants and pathogens. The Bloodborne Pathogens Standard is covered in each bloodborne kit, and outlines what supplies need to be included for the safe handling of waste material and items contaminated with blood or body fluid and direct contact with the same substances. There are several different options when it comes to choosing a bloodborne kit, however all kits will have the same basic and required supplies as set forth by OSHA. These typically include both personal safety items to directly address the safety of workers, and also supplies that can be used to clean up the area and dispose of materials in a safe and biohazard compliant manner. Personal or first responder bloodborne kits will contain the supplies for one person, so each first responder should have access to a kit if expected to work with any type of injury, accident or emergency situation that may include blood loss or loss of body fluids. 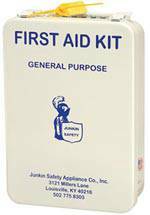 These kits typically are very small and compact, easily added to a personal first aid kit or emergency response kit. To protect the individual the kit should contain a full length gown that has full sleeves, providing protection for the body. These gowns are designed to be disposable and are only good for one use. Replacement gowns can be ordered to restock bloodborne kits and can be purchased in bulk. Eye shields that loop over the ears are essential to prevent the risk of fluids entering the first responder's eyes. These are also disposable, ensuring that they are always sterile and ready for use. Latex surgical or vinyl exam gloves will also be included in the kit, with antimicrobial wipes individually packaged provided. Most kits will also provide a guide or reference on how to correctly pick-up and dispose of body fluids. This guide is very handy for workplace kits where all staff may be required to respond. The guide will reference the specific equipment in the kit, so the bloodborne kit needs to be kept fully stocked with original supplies and equipment. To clean up blood and body fluid the bloodborne kit should contain a fluid solidifier compound that is used to form the blood or fluid into a gel allowing easy pick-up and disposal. A biohazard scoop as well as clearly marked biohazard bags, twist ties, towels and clear plastic bags will round out the bloodborne kit basics.